This article is about the microgame in WarioWare, Inc.: Mega Microgame$!. For the microgame in WarioWare: D.I.Y. 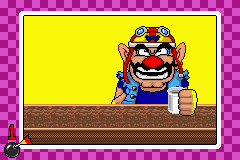 of the same name, see Mug Shot (WarioWare: D.I.Y.). Mug Shot is one of Wario's microgames in WarioWare, Inc.: Mega Microgame$!, found in the Introduction folder. It later returns as one of Wario Deluxe's microgames in WarioWare Gold. 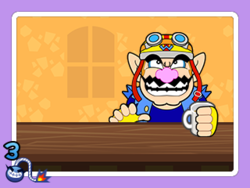 In this microgame, Wario has to catch his mug while it is sliding across the table. 1st level of difficulty: The mug comes from the left. 2nd level of difficulty: The mug may appear from the opposite direction. 3rd level of difficulty: Occasionally, two mugs come in opposite directions; one will come and stop and suddenly another mug appears from the opposite direction, which has to be caught. In WarioWare Gold, sometimes a mushroom has to be caught instead of a mug. This page was last edited on October 6, 2018, at 00:12.